Welcome to our 2003 World Cruise Blog! Our travels began two weeks early this year, January 5th, because Crystal Symphony's World Cruise departed from Fort Lauderdale, Florida rather than Los Angeles, California for the first time. So, we took the opportunity to visit Walt Disney World for about two weeks prior to traveling to the departure point and the complimentary overnight at the Mandarin Oriental Hotel Miami and Gala Bon Voyage Party. 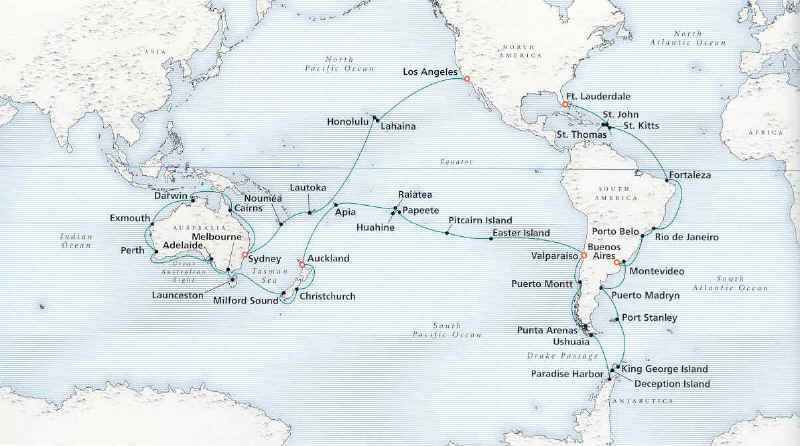 Following is a map of the itinerary, "Wonders of the Southern Seas". Click on a port to jump to that segment in the blog. Remember to click on the buttons below or the ports on the map above to view each section of the blog.